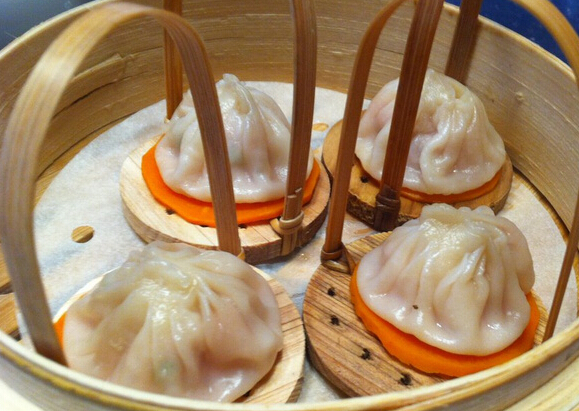 The 小笼包, Xiao Long Bao is the most famous type of 灌汤包, Guan Tang Bao, Soup Filled Bun, a dish enjoyed all over China, that began in the northern Song era (960-1127). It is said to have evolved from the Mountain Cave Plum Blossom Bun, an imperial dish that became a popular teahouse snack. The small buns resemble little lanterns when they are held up and viewed from the side, and chrysanthemums when viewed from top down, hence their name “Little Lantern Buns”. The Jiangxi and Jiangnan regions became renown for their crab roe Xiao Long Bao during the Ming and Qing Dynasties. Different areas within these regions specialize in producing the dish with different flavours, for example, Chang Zhou buns are enjoyed for their xian (a.k.a. umami) taste, and Wuxi ones for their sweet taste. The most famous Xiao Long Bao, the Shanghai Nanxiang, was first created in the late 1800s for the city’s Wanhua Teahouse. The techniques involved in making Xiao Long Bao are as exquisite as they taste, with six ways of kneading the dough that consist of three hard and three soft methods, before the skin is even made. The skin should be paper thin, translucent, smooth, yet delightfully springy when chewed. The famous soup inside these delicious steamed parcels is achieved by making the buns with stuffing (originally pork), which has been chilled to produce meat jelly. The jelly melts when the buns are steamed. The Nanxiang version is made with 14 folds on the skin, soup of meat jelly derived from pork skin that has been cooked in broth, and stuffing that changes with the year’s seasonal produce, from crab roe, to shrimp and other meats. So when the Xiao Long Bao you ordered is presented to you, wait for it to cool a little. Don’t pierce the skin. Eat it whole, let gorgeous soup fill your palate whilst you contemplate the amazing culinary dexterity you are enjoying.